Here at The School of Natural Health Sciences we believe any situation can be made holistic – even Halloween! 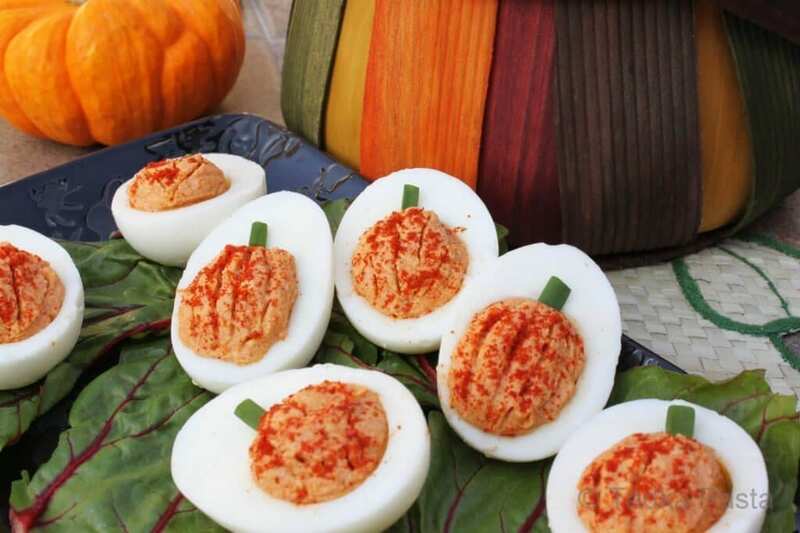 In this case, it’s about keeping the nutritional content high, unhealthy ingredients low, deliciousness off the charts and a spooky theme to set the standards. Have a hellishly healthy halloween! Made for real cheese lovers, though this recipe is quite high in fat content it’s wonderfully counterbalanced with fresh peppers and hot sauce. The perfect savoury treat that stands out and gets people giggling at the creativeness and ‘mmmm’ing at the warm deliciousness! Heat oven to 375°F. Line a large rimmed baking sheet with parchment paper. In a medium bowl, combine the cream cheese, cheddar, scallion, and hot sauce. Spoon into a resealable plastic bag and snip off one corner. Cut the jalapeños in half lengthwise, then remove and discard the seeds. Pipe the cheese mixture into the pepper halves. Unroll the dough and cut into 1⁄4″ strips. Wrap 2 strips around each filled jalapeño half to create a mummy-like pattern. (Leave a little space fro where you want the eyeballs.) Transfer the halves to the prepared baking sheet and bake until golden brown, 15 minutes. Let the mummies cool for 5 minutes, then place two peas or pieces of pepper or your candy eyeballs, on each one for eyes. Transfer to a platter and serve warm or at room temperature. What’s a Halloween party without a green dip? Made from good-for-you edamame and low fat ricotta cheese, serve this crowd pleaser in a large acorn squash atop a “fire” of crunchy crudité and breadsticks. Heat oven to 350°F. Line a baking sheet with nonstick foil. Cut off top third of squash (reserve top for a decorative lid). Scrape out and discard seeds and fibres with a spoon. Place squash cut side down on prepared baking sheet. Bake until flesh is firm-tender (a skewer poked into squash will meet a little resistance) and squash still retains its shape, about 30 minutes. Cool completely. Trim pointed end of squash to level it when inverted upright. Cook edamame according to package directions; drain, rinse under cold water and drain again. Transfer to food processor with ricotta, pesto, olive oil, lemon zest and juice, garlic, salt and pepper. Process until dip is smooth, adding a little water to thin if necessary, until medium-thick consistency. Place squash cauldron on a serving platter; fill with dip. Lean squash lid against side of squash. Arrange breadsticks and vegetable dippers emanating from squash outward to resemble the fire that a cauldron sits over. Place the yolks and all the other ingredients in a small bowl and mash until very smooth. Mound the yolk mixture into the egg whites or transfer it to a ziplock bag and pipe it out. Wet your finger and pat the surface of the filling smooth. Using a toothpick draw lines to make the ‘pumpkin’ indentations. Sprinkle with paprika if desired. Cut up the green part of the onion to make tiny stems and add them to finish off the pumpkin look. This lightly sweet and smoky take on hummus is the perfect snack, finger-food platter or fitting starter for any autumn gathering. 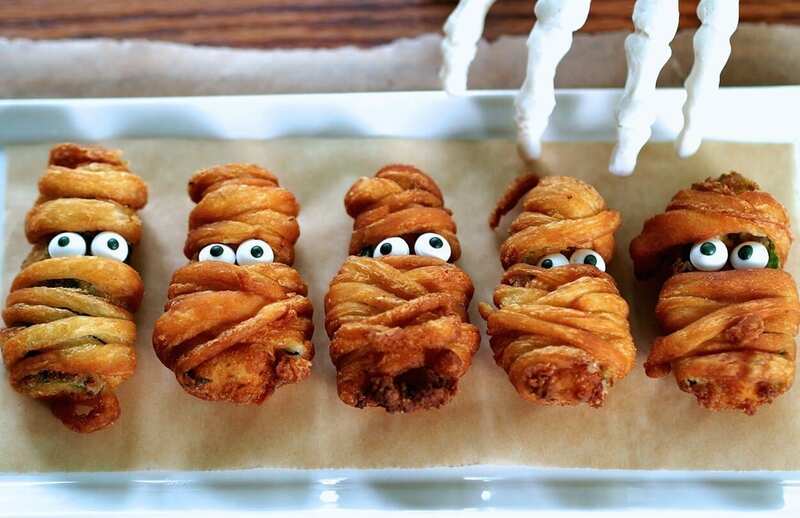 If you want to put your spooky take on the dish, use the ‘Cauldron Dip’ idea from Recipe 2, or create halloween-themed dippers in any shape you like by using cookie cutters prior to crisping them in the oven. I think bats look pretty cool with this dish. Lightly brush rough sides of pitas with olive oil; sprinkle with kosher salt. Cut each pita and arrange wedges in a single layer on baking sheets. Bake at 400° for 5 minutes; rotate pans, and bake 5 additional minutes or until crisp and golden. While chips bake, place pumpkin puree and remaining ingredients in a food processor; process until smooth (about 30 seconds). 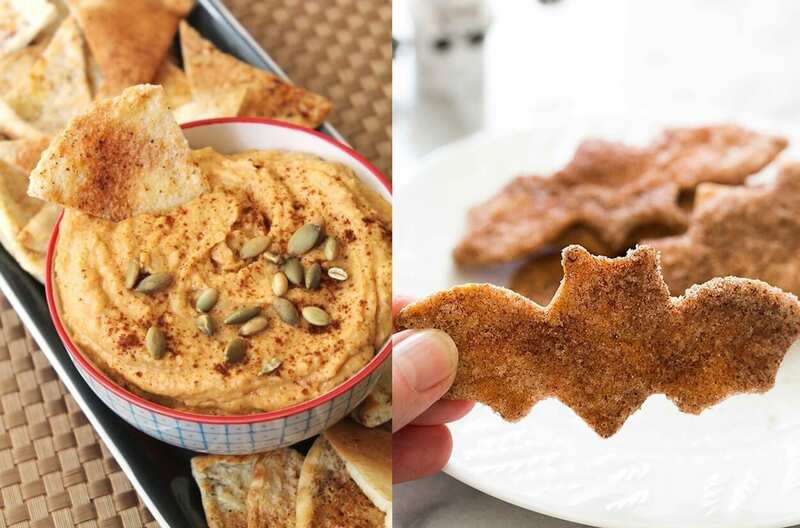 Serve pumpkin spread with pita chips. Heat coconut oil in a large pot over high heat. Drop 3 popcorn kernels into the hot oil and place a lid on the pot; cook until 1 kernel has popped. Remove the lid and pour in the remaining popcorn. Return the lid to the pot and cook popcorn, shaking pot back and forth over burner continuously, until there are 1 to 2 seconds between pops. Note: Take extra care not to burn the popcorn at the bottom of the pan, it takes a minute or so after placing the rest of the kernels into the pan. Quickly transfer popcorn to a large bowl; evenly drizzle honey over popcorn. Add salt and cinnamon; toss popcorn to coat evenly. 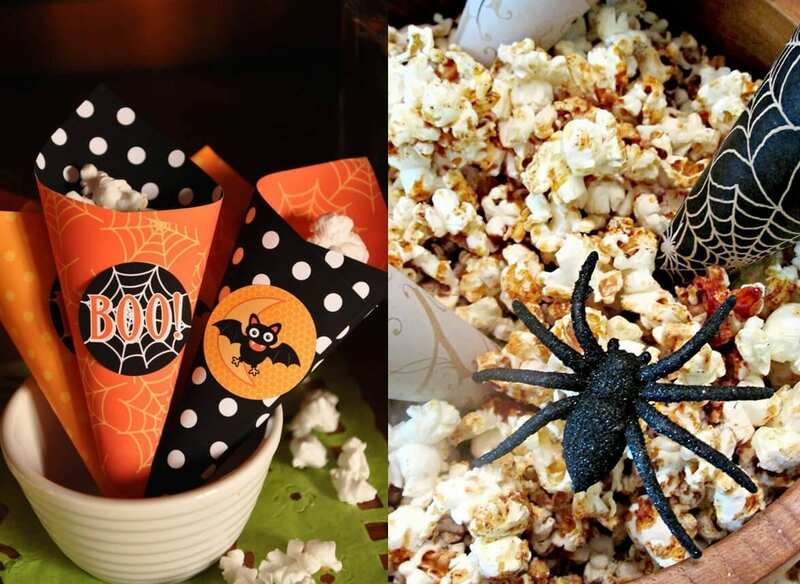 Serve in Halloween-themed paper cones on a platter sprinkled with orange confetti and fake rubber spiders. Interested in Nutrition? Why not get qualified? 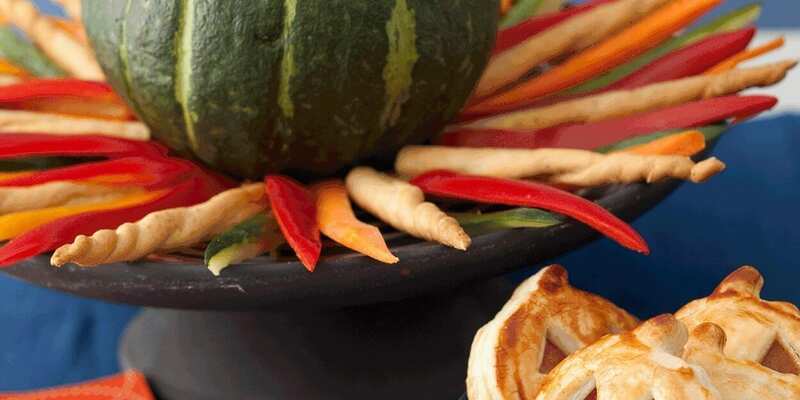 The School of Natural Health Sciences offers a Diploma in Nutrition. On successful completion of this course the student will have an understanding of human digestion, and the underlying principles of healthy nutrition and be capable of giving sound advice on nutritional requirements for good health. All our courses carry internationally recognised qualifications. Want to see some sample pages of our courses? Just email us!